Several weeks ago, I had the privilege to speak to a group of very special women via video feed. The church in California that The Bearded Wonder and I were very active in asked me to speak about the book Healing is a Choice by Stephen Arterburn and how I have, through my trial-filled journey with my family chosen healing. As I went through the book for the second time, I realized that I had come a long way since the last time I read it and that the choice to heal instead of to hide had become more natural to me. But most stunningly, as I read the book I realized that there are so many people whom I know and love who have not come to that place of healing. Their pain has not been allowed to heal and years later, it has manifested into half-lived lives. Consequently, I have been really thinking and praying for some women in particular who have hidden hurts. Women who have been injured by the cruelty of life and never been able to chose healing. We all know people like this. People who have secrets, who have pain and who are living out their wounds every day whether they can see it or not. Like all injuries, these wounds need to heal. But instead of airing them out and allowing the light to touch the dark parts of their wounded souls, these precious women have buried the pain. Decades have only compounded their fractured hearts and robbed them of freedom. Like a dark seed, that pain has taken root and those roots have reached out deep inside until they touch every part of their being. Abuse, unhealed, can lead to different behaviors in different people. One woman I know took her abuse as a banner over her which said that she was worthless. Her worthlessness led her to a life of drugs. If she didn’t really matter to anyone then why care? She had no idea how extraordinary she was, she just believed the lies she was fed. Years later, she is free of drugs, by the grace of God alone, but she is still harboring secret pain. No one is allowed to see who she really is because she still isn’t free. She is still unavailable. I know another beautiful woman who suffered terrible sexual abuse as a child. The abuse was never addressed, no counseling was sought. The wounds were stuffed deep inside and allowed to become rancid with pain. Decades later, those secrets, have turned her from a vivacious, sunny soul to a withered, unhealthy manipulator. Her zeal for life has been consumed by untreated mental illness and she is now isolated because she has emotionally attacked nearly everyone who loves her. Two very different reactions to the same problem: secret pain that is untreated and left to fester. It’s ironic, though not surprising, that so often the source of our greatest pains are from our family. The people we are supposed to be the most safe with are given the greatest access to our hearts, bodies and minds and, all too often, those people take advantage of that vulnerability. That, I believe, is the reason for generational sin. We are hurt and are trained to hurt. The cycle is reciprocated. Or the other issue is that we are hurt and our family doesn’t want to cause a stir or make a fuss. That’s where family secrets become skeletons in the closet. They say that time heals all wounds. They are wrong. An untreated wound, especially a deep one, will only grow deeper into a person’s psychology over time. The scar tissue will never form, the wound will just spread to other parts until it has consumed a person’s life. I think many of us know a bitter, old person. Someone who seems to hate all of life and everyone in it, who seems to have never had an ounce of joy or hope in their withering frames. I think my little sister can attest to this better than I . For years, she worked with the elderly and often she would tell me stories about sour, sad people who had no joy at all. I preferred the funny stories she would tell about being chased by angry ladies in wheelchairs, but the stories that struck me the most were of the deeply embittered. I know one such lady who, instead of healing from the wildly unfair things life dished to her as a child, has become bitter and suspicious. She had been through things I could never imagine and, because those things were off-limits for God to heal, her un-forgiveness sunk deeper into her. I could go on and on about the unhealthy manifestations of unhealed hurts I see in people and all of the different manifestations I see that hurt take later on in life. So could you. Because we live in world where no one is safe from cruelty and invariably we, or someone we love, will be affected by it. God promised this would happen. He said don’t be surprised when hard things happen. In fact, count on it. It will happen. That’s life in the fallen world. But that’s not where it ends. He says to expect it, look out for it because it is surely coming, but he also says that he has a plan for it. That plan is ready to be worked out in your life and mine. But only if we are ready to trust him with the pain. He can take the horrible things that life dishes out and hold them in his hands ever so tightly until that lump of coal you have given to him has turned into a diamond. Then he returns it to you; something beautiful, surprising, new. The pain I surrendered to God when I allowed him to heal my depression turned into counseling opportunities with teen girls and chances to encourage women with secret depression. The pain I surrendered to God about the many fears, changes and uncertainties I face every day with Jack and his heart condition has allowed me the opportunity to grow in my faith in leaps and bounds and to meet and minister to people who are in the same place in life. I’ve not arrived but I am choosing to heal. It’s an active choice, never passive. And it’s a daily choice. That is truer than true. But it shouldn’t lead a person to believe that Christ means for us to quietly be healed by him alone and without the help of his family, the church. People can be wretched. Christians can be wretched. Trusting others with our unhealed hurts is a tricky thing. Finding people who are safe, nurturing and growing in their faith is a good place to start. Very often I have heard kindly meant advise aimed at hurting people which only leads to greater pain and confusion. It is so important that healing begins in safety, and it is so important that is begins. We are part of the body, meant to take and to give to one another. In taking healing help from mature believers we then, become able to give that healing to someone down the road. As my favorite pastor, Bob Ouzts, often says, our ministry is what we have been healed of. That means that our ministry isn’t what we keep hidden, or what we put a brave face on about. So in a way, you have a responsibility to seek out healing, because somewhere down the road someone is waiting for you to put your arm around them and guide them down the path you’ve walked. 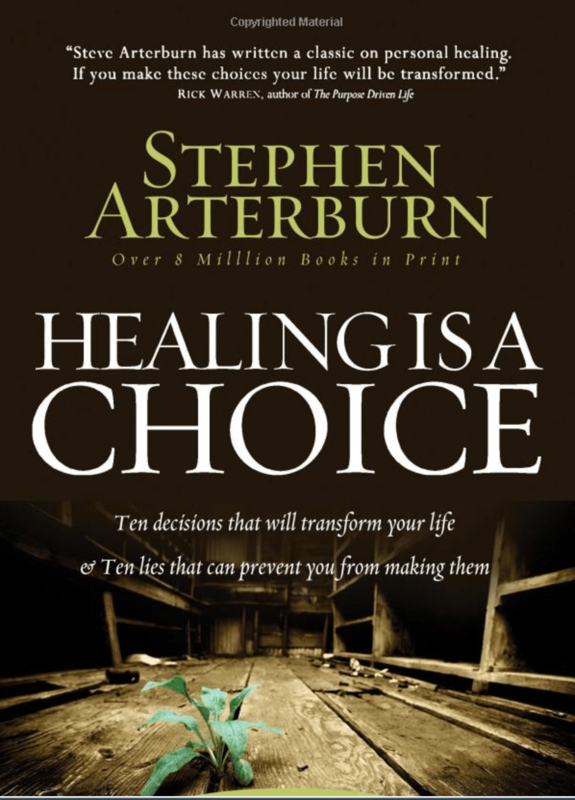 Also, check out the book Healing is a Choice by Stephen Arterburn. It is a great way to get your heart and mind prepared to a long journey of healing.